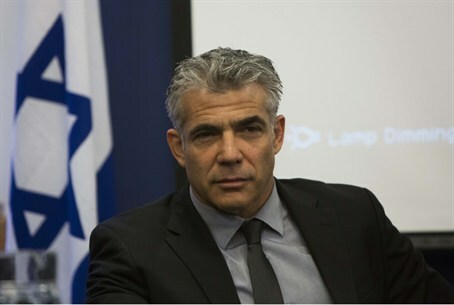 In an interview with Army Radio, Finance Minister Yair Lapid congratulated the government for approving the bill on on hareidi-religious army enlistment. The bill was approved unanimously by government ministers, and is expected to be brought up for a Knesset vote as soon as next week. Lapid stressed that there was nothing to fear from the bill. “Hareidi religious Jews will soon realize that this is for their own good. It takes time to get used to new things, but they will. “We will now be hearing the rants and raves, mostly from politicians from hareidi parties, about how horrible the new situation is, but the average member of the hareidi religious community is looking for change. Members of this community no longer wish to be among the poorest people in Israel, and they do not want yeshivas to be a refuge for draft dodgers,” he said. Lapid said that hareidi-religious Jews understood what was at stake. “They are trapped inside a caricature of their own making. Some will scream, but in their hearts they know that a positive thing has happened. Not everyone is a 'Chazon Ish,' and not everyone is the Ba'al Shem Tov,” said Lapid, referring respectively to Rabbi Avraham Yeshaya Karelitz, a sage who settled in Bnei Brak and opened one of the first new European-style yeshiva institutions in the post-Holocaust era, and to Rabbi Yisrael Ba'al Shem, the 18th century leader who is considered the father of Hassidism. “Not everyone wants to remain in the yeshiva for years on end. Now we are helping them to make that exit,” Lapid said.